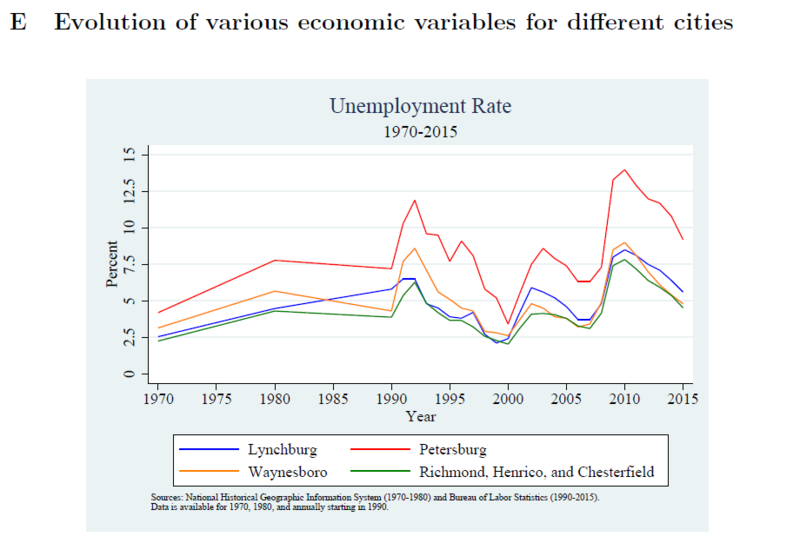 “Following two centuries of general economic prosperity, Petersburg has experienced a prolonged period of decline. A fixed-boundary city combined with a shrinking population may have left the city vulnerable to negative economic shocks as city officials faced “fixed” municipal costs in a context of declining tax revenues. When large layoffs occurred beginning in the 1980s, the city appears to have lost residents, especially higher-skilled residents, to the Richmond suburbs north of the city. Additionally, a new regional shopping center in neighboring Colonial Heights drained the city of retail tax revenues. These development led to a prolonged period of decline in the city. But other Virginia cities also experienced substantial layoffs around the same time as Petersburg, yet they did not decline to the same degree. The question is why? We model two scenarios. The first incorporates two cities, one relatively economically vibrant and the other less so. We show that a negative productivity shock to the less vibrant city will lead to an outflow of high-skill workers to the more vibrant neighboring city along with higher-value homes. As tax revenues fall, the city experiences fiscal decline, which amplifies and reinforces its decline. We also model an isolated city in which a negative shock does not result in as large of an outflow of high-skilled workers. In this setting, the city experiences a loss in aggregate utility for residents but is in a better position to weather the shock and eventually return to a path of economic growth.